And mine crypto while you're at it. Robot Cache is a digital store that lets you buy games, resell games and, should you choose, mine cryptocurrency that you can use to buy new games. It's a fascinating experiment. According to its creators, the system uses blockchain technology to verify each digital sale and its movement between accounts, creating a form of DRM that stops games from being duplicated within the network. The security of the blockchain means that each unit can retain value. That means that players can sell games they are done with and, unlike with physical retail, publishers can take a cut of the resale. There are advantages for players and publishers, in theory. "People are ready for something different," says Robot Cache CEO Lee Jacobson. "You've seen some of the backlash. Fortnite's not going to be on Google Play because of that 30 percent. Bethesda's going to set up their own store and not be on Steam because of 30 percent. You're seeing this wave." 30 percent refers to the cut that Steam takes for each sale. It's a price worth paying for many publishers and indie developers to access Steam's massive user base. Robot Cache wants to take five percent. On a resale you take 25 percent of the game's value back, five percent goes to Robot Cache, and 70 percent goes to the developer/publisher. In addition, as you mine Robot Cache's IRON currency for yourself, the client mines the hot cryptocurrency of the moment and sends that back to Robot Cache. I ask if the mining activity is designed to offset the reduced cut. Jacobson suggests that reduced distribution overheads make the lower cut viable. "Frankly, using distributed file systems, you don't need to use Amazon now to serve games, you can use blockchain-based secure- basically like bittorrents only secured by blockchain. "In other words it's all pieces on the internet, but because of the way it's put together using blockchain you can get much faster download speeds and served at pennies on the terabyte and not dollars on the terabyte." Jacobson describes mining as a useful "hedge," though it's not hard to see the potential value should the platform achieve a large userbase. Jacobson is also keen to stress that the mining aspect of the client is strictly optional, and you have to opt in to start the mining process. "People ask us 'why can't I just go set up my pool and mine it?' Go do it! I mean, I don't, I'm a gamer, I don't really want to set it up. We love Steam, we love those guys. I've known Gabe for many, many years. Very successful, obviously, the gorilla in the room. "For those people who don't want to deal with it, maybe it's Johnny, he's 15 years old, maybe he has a limited amount of income and he wants to say 'in addition to selling my game I may want to supplement that with some dollars on my account and buy 6, 8, 10 games a year.' It's completely up to them, we don't care one way or the other. We back it all up with currency on our side so there's never a token that doesn't have a value." So far 505 Games, inXile, Paradox, and THQ Nordic have been announced as publishing partners, with more to come. An early access deployment is planned this month, and there will be "many iterations to follow until the official launch." There is a lot of testing and experimentation to be done. Looking ahead to 2019 and beyond, Jacobson imagines players completing games and unlocking achievements to increase a game's resale value. That'll probably never happen, but it shows they're willing to go down all sorts of avenues that other digital storefronts so far haven't. Robot Cache one to keep an eye on, and more competition for Steam can only be healthy. 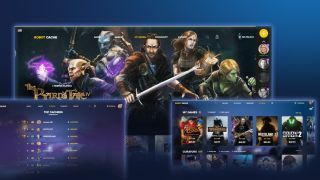 "We think we're going to build an interesting ecosystem that's an alternative to Steam, says Jacobson. "We love Steam, we love those guys. I've known Gabe for many, many years. Very successful, obviously, the gorilla in the room. "People say 'what if Steam comes in and does this.' I'm like 'first of all that's a good problem to have because that would mean the industry has just gotten back how many billions of dollars.' If we are fortunate enough to even get them to notice, then we do five to ten percent of market share, then we're doing a very healthy amount of revenue for what they're doing, and again the gamers will win." If you're curious, you can find out more on the Robot Cache site. For more on cryptocurrencies, here's everything you need to know about cryptocurrency mining at a glance.